MOST INGREDIENTS ARE ORGANIC WITH THE EXCEPTION OF CHOCOLATE MORSELS. Line a baking sheet with parchment paper. Place the cashews, walnuts, coconut flakes and pumpkin seeds into a food processor and pulse to break the mixture into smaller pieces. In a large bowl, mix the coconut oil, vanilla, and maple syrup together. Add in the mixture from the food processor and the chocolate morsels, and stir to coat. Stir in spices and sea salt. Spread the mixture out onto the baking sheet and cook for 20 to 25 minutes, stirring once, until the mixture is lightly browned. Cool for about 15 minutes, and then break into chunks. 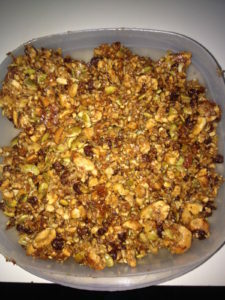 THANK YOU TO MICHELLE TOOLE/HEALTHY HOLISTIC LIVING, FOR THE ORIGINAL RECIPE WHICH I HAVE TWEAKED ADDING IN WALNUTS AND CHOCOLATE MORSELS! Wishing you Harmonious Health 4 Life!